Many people in the winter have a problem with dry skin. Due to this the skin glow starts to diminish. But if we mix some things in the milk every day then the glow of skin can be increased. Milk & Cashew: Daily keep 2-3 cashews in 4-5 teaspoon milk. 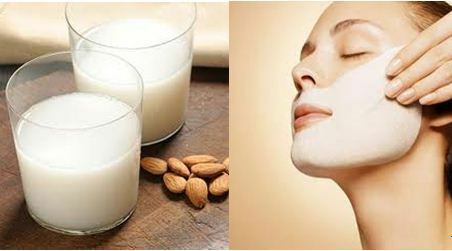 Grind these cashews in morning and apply it on face for 30 minutes. This controls wrinkles and increases glow of the skin. Milk & Rose Water: Mix 2-2 teaspoon milk and rose water. Keep this on skin for 20 minutes. This helps to increase glow of the skin. Milk & Turmeric Powder: Mix half teaspoon turmeric power in one teaspoon cream and apply it on face. Wash it with water after 30 minutes. Daily do this morning-evening. Milk & Honey: Mix 2-2 teaspoon milk and cream. Apply it on skin for 30 minutes. This avoids dryness of skin and skin becomes soft. Therefore, the glow of the skin increases. Milk & Lemon: Mix 4 teaspoon milk in 1 teaspoon lemon juice. This avoids spots of skin and glow of the increases. Milk & Banana: Mix half banana in 4 teaspoon milk. Apply it on face. Wash the face after 30 minutes. This avoids dirt of the skin and increase glow of the skin.